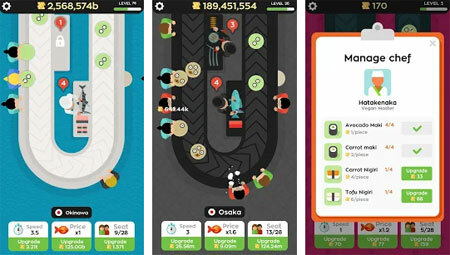 Sushi Bar is an addictive sushi restaurant simulator from Green Panda Games. Open your own sushi restaurants in the best cities of the world, and satisfy your customer. Your ultimate goal is to become a trillionaire. Unlock and upgrade famous chefs and cook crazy dishes. Insane power-ups to multiply your earnings. If you get stuck in the game, check out the video walkthrough and gameplay for the game. This entry was posted in Android Games, iOS Games, Mobile Games, Walkthrough and tagged Sushi Bar Cheats, Sushi Bar Gameplay, Sushi Bar Guide, Sushi Bar Strategy, Sushi Bar Walkthrough by Marvin. Bookmark the permalink.